A Welsh language general periodical that published articles on religion, politics and history alongside poetry, biographies and news. It is also notable for articles on slavery and the French Revolution. Originally a quarterly it became a bimonthly publication in 1794. The periodical was edited by the minister and author, Morgan John Rhys (Morgan ab Ioan Rhus, 1760-1804) with the poet and man of letters, David Thomas (Dafydd Ddu Eryri, 1759-1822), a major contributor. 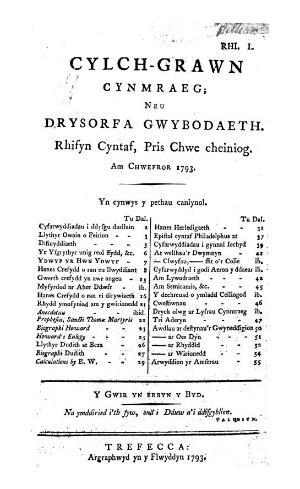 Associated titles: Y Cylchgrawn (1793).